Words are not enough to describe their scenic beauty.....Lonavala or Lonavla, and Khandala are the two popular hill stations in the western part of the state of Maharashtra. Lonavala is situated at a height of 625 mtrs above sea level and Khandala lies a bit lower, in the western ranges of Sahyadari mountains. These hills stations lie 5km apart on either side of the Mumbai Pune highway. Discovered in 1871 by Sir Elphinstone, the Governor of the Mumbai Presidency, Lonavala is absolutely mind-blowing and is blessed by nature in bounty with valleys, hills, waterfalls, greenery, lakes and a pleasant climate. And Khandala, though relatively small, is equally blessed with nature like Lonavala. As Khandala is small in area, you can explore the entire region in a couple of days. Both these are separated by a deep valley on one side and high hills on the other side. Popularly known as the Jewel of the Sahyadri Mountains, Lonavala's name is derived from the Sanskrit word 'Lonavli' meaning 'city surrounded by caves'. A popular gateway from Mumbai and Pune, Lonavala ( located 110kms southeast of Mumbai and 64kms from Pune), is simply the most convenient base for tourists to visit the well known ancient Buddhist rock cut caves of Bhaja and Karla, which are located nearby. It is a popular health resort and is also famous for jams and Chikkis, a sweet candy made locally. The origin of Lonavala -Khandala is unclear. The area was once under the rule of Chattrapati Shivaji, the founder of the first Maratha Empire and later the Peshwas (who founded the second Maratha Empire) and was finally taken over by the British when they overthrew the Peshwas. Both these are ideal places for adventure lovers. There is hardly any demarcation between the two hill stations. One can stay at Lonavala which has more hotels and a good market and visit Khandala from there. One can try trekking, paragliding, waterfall rappelling (during the monsoons), and hiking. For this, tourists may get in touch with the Maharashtra Tourism Development Corporation (MTDC). The main tourist spots here are the Sunset point, Monkey point, Tiger leap, Lion point, Bushy dam and the several forts, caves and lakes but more than these, the water falls you get to see enroute to these places, are the most enjoyable ones. You should take note that after 6:00 pm when it gets dark, all caves and forts close down. In Khandala, 8 Km from the Lonavala town center is the famous Rajmachi Point where there is a small Park which gives spectacular views of the places around. This place got its name because, the great Maratha ruler Chatrapati Sivaji's, Rajmachi Fort is situated opposite to this point. Here you can enjoy the beauty of valleys and waterfalls. It is particularly misty and picturesque during the monsoon season. Rajmachi Park has a temple and a children's park. This is also a famous location for film makers. The famous Vaghjai Dari (Tigers leap) is also located here. Monkey point, Sunset Point, Lions Point are the few attractions near by. Sunset point, gives spectacular views of the sunset. You can see expressway, rail and national highway at one place. The mountain spur seems like a tiger leaping into the valley, that is why this name. At this point one can get a splendid view of Lonavala town. Echo point here is most famous. Near INS Shivaji, this point gives a fascinating view of the valley. This is a popular view point, because dozens of monkeys come and sit near the train waiting to be fed by visitors. All the trains coming from Khandala stop here for a few minutes to prove their brake power. There is an entry fee of Rs.5 to the Monkey point. Situated above Khopoli town, one can approach this place from Khopoli as well as Barghat reversing station. Lion's Point, located 12 km above Khandala is another popular spot. Here you can enjoy spectacular views of the deep valleys and ghats. 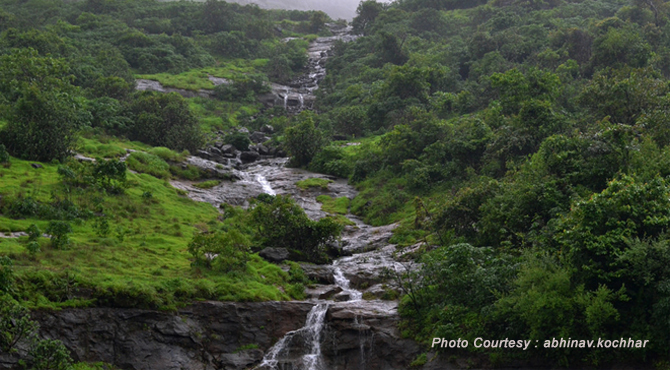 Cascading down from a height of 100 feet, this breathtaking waterfalls is located between Lonavala and Khandala. The water is full for many days even after the monsoon is over. One can have a cool and refreshing bath at the base of the falls. This can be seen in Khandala hat while coming from Mumbai. I.N.S.Shivaji is a Naval Engineering Training Base located 8 kms from Lonavla town. The nearest railway station is Lonavla. Located 6km outside Lonavla on the INS Shivaji road, this dam is full with water during monsoon season. The place is crowded by people because the water overflows over the steps of the dam creates an interesting waterfall. Swimming is not allowed in the dam. The lake is spectacular during monsoon. Situated on the way to INS Shivaji, this is a spectacular tourist place. Owned by central railway, it was constructed in 1876. River Indrayani is supposed to have originated here. Situated north of S.T.Stand near Tungarli village, this beautiful lake supplies water to Lonavala town. There are no buses to the site, but taxis and auto rickshaws are available from Lonavla Station. This area near to Lonavala is owned by the Tata company. There is a dam here with a garden and Pisiculture centre nearby. This a restricted area and Photography is not allowed here. Named after an English officer Mr.Rye, this beautiful garden lies just behind the main market area in Lonavala. Sprawled over 25 acres, this park just half a kilometer from Lonavala Railway station has full of natural vegetation, groves of evergreen deciduous trees, creepers and climbers with plenty of space for children to play. There is a famous Siddheshwar temple inside the park and an old Christian cemetery opposite the park. Open to public throughout the day. Barghat reversing station once belonged to the railways and now remains unused. At night, this place is illuminated with hundreds of lights and offers a beautiful view. This is the separating point of Pune and Raigad District. Dating from around the 2nd century BC, the superb rock cut caves in the hills near Lonavla on the Pune highway are among the oldest and best preserved Hinayana Buddhist caves in India. It is maintained by the Archaeological Survey of India. There is a drive of around 500 metres up the hill and around 150 stairs climb on foot, to reach the Karla caves. There is also a temple here. Entry Fees - Rs.5 for Indians and 10 for Foreigners. This fort is situated in the Lonavla region, 10 kms from Lonavala town on top of the Western Ghats. Surrounded by thick forests and set amidst deep valleys on three sides, you will have to trek by foot to see this famous fort. It has two additional forts- the taller one in the east is Shrivardhan and the other in the west is Manoranjan. An ancient temple of Shri Bhairavnath lies between Shrivardhan and Manoranjan. There are watchmen posts at the entrance, which is semicircular in shape. A Buddha Cave and two huge water tanks are the significant feature of this fort. One of the tanks is near the caves and the other one near the fort. At one end there are residences of people staying at the fort and on the other end are the quarters for the guards. The fort also gives a wonderful view of Forts like Lohagad, Visapur, Tungi, Korigad, Nagfani. Manoranjan fort almost in ruins can be reached via the road behind Shri Bhairavnath temple. The watchmen houses and ammunition depots are the only notable structures which remain. There is a square lake, which is filled with clean water all year round. A straight rock divides this lake into two parts and only people familiar with the place should attempt to walk through it. Khandala railway station and the forts at Karnala, Matheran, Pali and Nagfani can be seen from here. Located 10 kms from Lonavala town, the fort was captured by the great Maratha ruler Shivaji in 1670. Its spectacular entrance has three successive gates, of which the third gate is the most notable. The walls of the fort has unusual designs. There is a water tank inside the fort believed to have been built by Nanasaheb Phadnis of the Peshwa dynasty. Outside the fort there is a huge cave with a Shivalinga and a tomb nearby. The fort to the east of Lohagad Fort, is a two hour trek (one way) from the base. There are caves and waterfalls (during monsoon) in between, on the way to the fort. The intricate design on the walls of the fort still remains intact. There is a semicircular pass between Lohagad and Visapur fort, which can be viewed from the railway bridge at Lonavala station. The approach to Tunga fort is quite difficult with steep climbs. There is a temple dedicated to Mahadeo here. During Shivaji's reign this fort was used as a watch tower.